SUN 18–MON 19 Teaching at Bezalel Academy for Art and Design in Tel Aviv. There are 40 students so days are long. In the evening I visit a market opposite the hotel, where a man runs a stall selling bootlegs. The Nirvana CDs look interesting after seeing Last Days, Gus Van Sant’s film based on the life of Kurt Cobain. The next stall sells guns, bayonets, knives, wooden and leather night-sticks and loose ammunition. I settle for an old spirit level. Off to Holon Digital Arts Lab for some research into Israeli and Palestinian video art for an exhibition in autumn 2006. Galit Eilat, who runs the centre, has amassed a fine archive of material and within an hour she pulls enough DVDs off the shelf to keep me occupied for the rest of the day. It’s fascinating stuff. Galit gives me a series of contacts for Palestinian video material. That’s going to be more difficult to research. 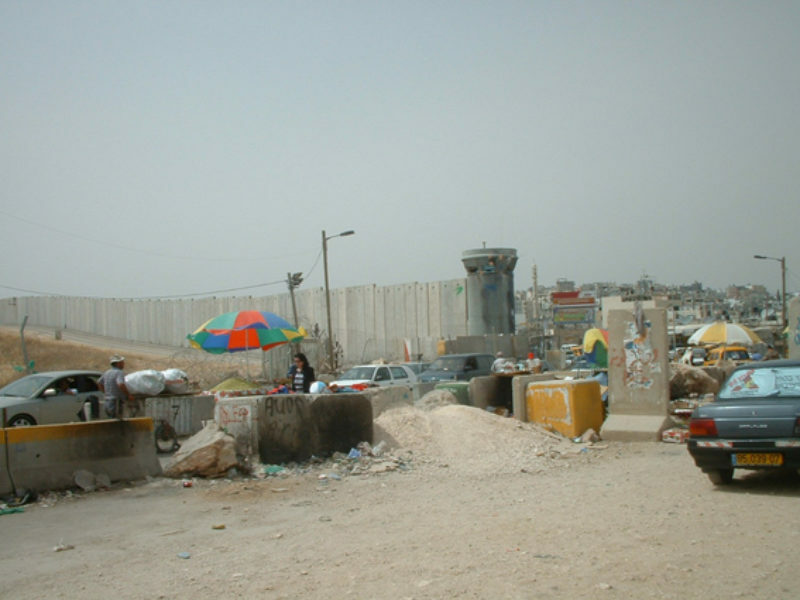 Less of that work is gathered in collections; and travel in the West Bank is slow and complicated. I spend the entire day making extensive notes on all I’ve seen. Back in the hotel, cable TV shows endless re-runs of Friends . Never sure where to eat on my own, so I settle for a giant fruit smoothie at a street counter—just about every other shop makes them and, after Scotland in December, it’s uplifting to see real fruit. Galit had mentioned a late-February conference in the West Bank near the Kalandia checkpoint. Israeli and Palestinian artists will gather to discuss working together on a joint project. Various speakers are being invited and Galit suggests I talk on political pressures on artists in Northern Ireland during the Troubles. Now I wonder if the subject is too historical for the current situation here. It seems not. The BBC News website reports that the Ulster playwright Gary Mitchell has just been driven into hiding by Loyalist paramilitaries who don’t like his depiction of the Protestant community (of which he is a member). So much for history. Another five tutorials this morning. In the afternoon I present a new lecture, trying it out for the first time. I enjoy the opportunity, as lecturing is something I do only sporadically. It’s one of the best ways to assemble new material and a good method for testing it out. You can look at notes for days, but only have to utter the thought in front of an audience to realise instantly whether it makes sense or whether it’s rubbish. Later, I walk back across the city to the hotel. At the reception desk there are three packages for me, all DVDs dropped off by artists or curators who have heard through the grapevine I’m looking for artworks. I head out again in search of food and remember a place down an alleyway, called Salon Mazal—it serves good small meals for loners. Cats wander in and out of the café all the time, but this isn’t unusual. Every street here has its own feline colony. The schedule says, ‘Day Off’, but there are still five more students to meet. They make me tea and coffee to compensate. One has brought popcorn, a Twix, a Snickers bar, a box of teacakes and a strange bag of peanut butter Wotsits. It’s scary how students see right through you. There’s a series of openings later on—some large museum shows and video screenings with a party attached. I’ve got to head to the airport, though—three or four hours to get through security and the flight is at 3.40 in the morning. Security officers quiz me on the reasons for my visit. Can I prove I know anything about art? This is too close to the bone. Fortunately they somehow get distracted by the French. What’s wrong with them, they ask, why won’t they speak English like everyone else? I argue that it’s healthy not to speak too much English and, anyway, the French follow no-one—a good thing in itself. This defiance seems to earn me grudging respect and I end up in the duty-free zone faster than usual. I buy another smoothie. Schiphol airport, Amsterdam—a spiritual home. Conk out in the meditation zone and wait for seven hours. Son House, Willie Colon and Seamus Creagh play to me through headphones. Down by the shops two Santas play carols in swing time. Can’t shake thoughts of Gary Mitchell.